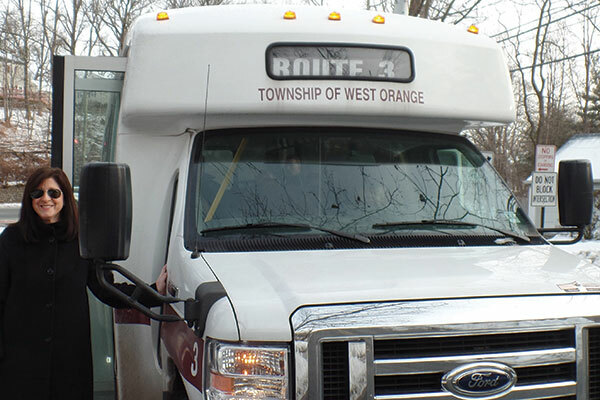 The West Orange commuter jitney picks up residents in the Gregory section of West Orange. After more than a year of grassroots campaigning, a West Orange resident has successfully obtained jitney service to shuttle people in a part of town with many Jewish commuters to NJ Transit train stations in nearby towns. The service is expected to start in August, after the cost — estimated at around $75,000 — is approved at the Township Council’s next budget meeting in March. The impetus for the jitney came from Deena Rubin, a local realtor who has lamented for years that West Orange has no train station of its own. Jitney service has provided a link between Manhattan-bound commuters and residents in select neighborhoods of West Orange. Many of Rubin’s prospective clients chose to buy homes elsewhere because there was no public transportation service between their neighborhoods and railroad stations in other towns. She intensified her campaign in January 2016, organizing rabbis and members of synagogues in the Pleasantdale and Redwood areas — the Orthodox Ahawas Achim B’nai Jacob & David, Congregation Ohr Torah, and Young Israel, and the Conservative B’nai Shalom — all situated along Pleasant Valley Way. The people who attended that meeting broke into smaller groups to attack the issue from different angles, including marketing, planning routes, and estimating costs. “I didn’t want to start a fight with the mayor’s office,” she said. But she was told the main stumbling was expense, especially when it came to insurance rates and hiring drivers. One of the big problems her committee tackled was where commuters would park their cars before boarding the jitney. AABJ&D offered its large parking lot, as did the Pleasantdale Presbyterian Church a few blocks away at the corner of Eagle Rock Avenue and Pleasant Valley Way. Council member Michelle Casalino became the first local elected official to push for the project. A fellow member of the real estate industry, she met Rubin at an open house for real estate agents sponsored by the town of West Orange. “It was mainly because I was in the right place at the right time,” said Casalino. She told Rubin and her committee members that grants from NJ Transit initially provided the start of the town’s jitney service. Then “grants dried up and it had to be folded into the town budget,” Casalino said. The council has not had detailed discussion on the new jitney and its proposed route, according to Casalino. “Obviously it is going to enhance the appraised values of homes in these neighborhoods. Adding any additional service in these neighborhoods will increase market value,” she said. Although she may be the project’s biggest booster, Rubin said she’ll oppose any increase in property taxes.